You may have seen them wowing audiences around town or in Kelowna and on Sunday, June 24th, they are coming to the Caetani Cultural Centre! 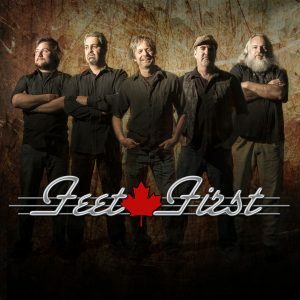 Feet First is a band based in Vernon since 2009, specializing in classic rock covers that get audiences dancing and singing along. This is a band whose motto is “classic rock played right.” With their own unique blend of influences including folk music and 70s rock, they will be ushering us into the summer with well-known favorites by the likes of Led Zeppelin, The Who, Steely Dan, and more. Feet First will be treating us to a energetic live performance Sunday, June 24th.